Add aggressive good looks quickly and easily with Rough Country's Fender Flares. Add aggressive good looks quickly and easily with Rough Country's Fender Flares. Nothing compliments a new lift, wheels, and tires like a set of stylish, mean-looking fender flares. 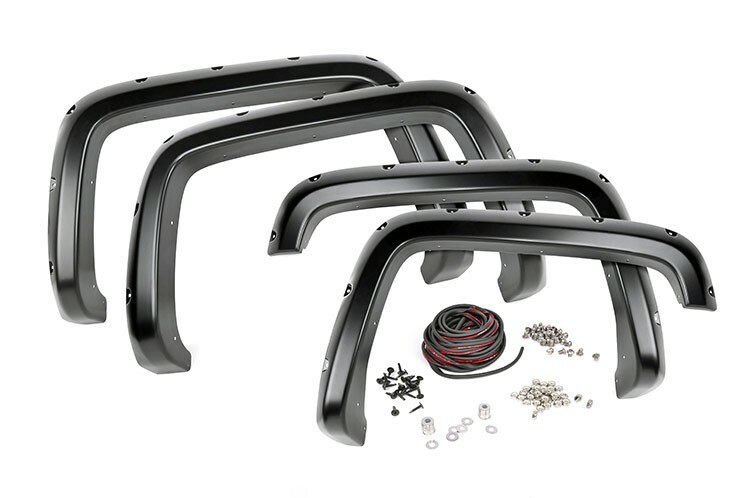 Rough Country's Fender Flares are designed with a simulated riveted look. These fender accessories bolt-on quickly and easily in a few secure mounting points, making installation a cinch. No cutting or drilling is required to install, and these flares can be easily removed and return your truck to stock! These UV treated fender flares ship in flat-black or can easily be painted to match your vehicle, and are designed to withstand the sun, rain and other elements of nature. Rough Country Fender Flares are guaranteed to be free of defects for 3 years!